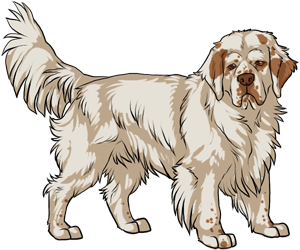 The history of the Clumber Spaniel is cloudy. It is believed to have originated in 18th century France alongside the Basset Hound and Alpine Spaniel. The breed was prized for his ability to hunt in heavy cover. He was very quiet and was able to come close to the game. The breed got their name after Duke of Newcastle's Clumber Park which a French kennel moved in order to preserve the breed during the French Revolution. Is a gun dog; will retrieve birds that the owner shoots. An excellent tracker but slower than most other gundogs.